These mini banana cream pies are made with a shortbread crust, a slice of banana, homemade banana pudding, and topped with whipped cream. They’re the perfect tiny dessert that doesn’t require a plate! 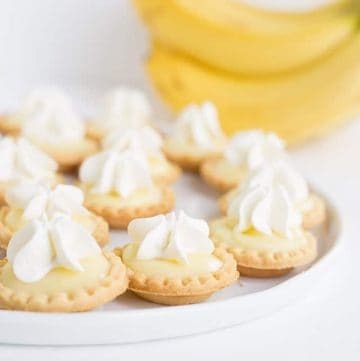 These mini banana cream pies are absolutely adorable. I don’t think anyone could resist them even if they hated bananas. They’re that cute. They make great finger foods for my people with the sweet teeth. I mean every appetizer table should have a dessert or two. Here’s the best part, you don’t need a plate to hold your tiny pies. Two bites and they’re gone. I like to buy these shortbread tart shells online. They’re cute and save so much time. If you want to make your own, you can fill use a mini cupcake pan and fill them with graham cracker crumbs like I do my cheesecakes. With these tarts being so little, I bet you were thinking that I wouldn’t add some slices of banana to the banana pies, but I did! The thing with bananas in desserts is that they can turn brown. Some people like myself are okay with that and some people aren’t and that’s okay. We can solve this dilemma. You can give the slices of banana a spritz of lemon juice, but I don’t always have lemon juice on hand. Instead, I always have Ball fruit-fresh on hand. That’s what I use to can fruits in the late summer and early fall months. This homemade banana pudding doesn’t actually have bananas in it. I wanted to warn you before you get too excited. I used banana extract instead. I LOVE banana extract. It reminds me of banana laffy taffy. I like to start making the banana pudding by adding sugar, cornstarch, and salt in a medium saucepan together and whisking until everything is incorporated. I do this to prevent the cornstarch from getting lumpy when liquid is adding. Next whisk together the large egg yolks and a couple of tablespoons of milk and pour it into the sugar mixture. Whisk until a thick mixture forms. Then add the remaining milk and heavy cream into the saucepan and whisk. I like to add the yolks and just a small amount of milk into the sugar mixture first to just further make sure that there are no lumps forming with that pesky cornstarch. I start with making the banana pudding. My recipe is down below. Let it cool until it becomes thick and custardy. If you’re making the crust, do it while the custard is cooling. If you’re working with a graham cracker crust, place those in the fridge to firm up. Slice the bananas and coat them with the fruit-fresh or lemon juice. Place them in the bottom of the mini pie crust. Filling the rest of the crust up with banana pudding. Put the pies in the fridge to cool and begin whipping up the whipped cream. Top the mini banana cream pies with the whipped cream. I used the 1M piping tip and piped it on top. You can do this right before serving or ahead of time. The whipped cream will start to break down after a day or two though. Yes! So the homemade banana pudding is loaded with milk and egg yolks. It’s also topped with whipped cream which requires refrigeration too. Plus warm mini banana cream pies don’t even sound appealing. These mini banana cream pies are made with a shortbread crust, a slice of banana, homemade banana pudding, and topped with whipped cream. They're the perfect tiny dessert that doesn't require a plate! In a small bowl, add the egg yolks and 2 tablespoons of milk. Stir to combine. Add the yolk/milk mixture into the saucepan with the sugar and whisk until smooth. Add in the remaining milk and heavy cream. Whisk until everything is incorporated. Remove from the heat and stir in the banana extract and cold butter. Place the plastic wrap on the surface of the pudding. Place in the fridge until it's set up. I let it set up overnight. Peel the bananas and slice them. Use lemon juice or fruit-fresh to keep the bananas from turning brown. Place a slice of banana to the bottom of each shortbread shell. Fill the remaining shell with the chilled banana pudding. In a mixing bowl, add in the heavy cream. Whip on medium until soft peaks form. Add in the powdered sugar and beat until stiff peaks form. Add the whipped cream into a piping bag fitted with a 1M piping tip. Pipe whipped cream on top of the mini pies. Store in the fridge and eat within 1 - 2 days.